Gatherer is an open source project, and is built upon the donations and the support of the community. + GATH-168: MoP Ore/Herbs added. Treasure has not yet been considered, nor have non-English translations been added yet. - GATH-169: Archaeology support is now completely custom from other Gathererables. Nodes are now only displayed on the Minimap, and only for a brief time after Survey is cast. - GATH-160: Archaeology are now fully supported. Display is basic and will be expanded upon. - GATH-163: Added difficulties for all known nodes. - GATH-160 (In Progress): Archaeology nodes will now be recorded. Display is still under development. 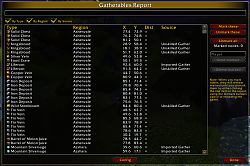 - GATH-68, GATH-148: support for WoW 4.X..Includes support for multi-profession tracking (ie. tracking Herbs and Ore at the same time). - GATH-55: Display notice about gatherables window in confirm popup. 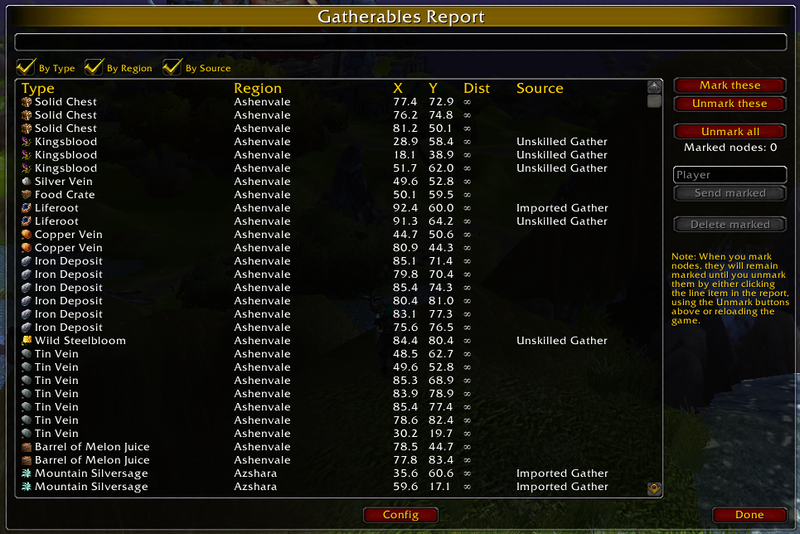 - GATH-67: added support for Northrend Herbs and Ores. Still missing some non-English locales. Gatherer has been massively restructured and re-written for version 3.0. Any chance of a 7.3 Update? Last edited by bazzzyl : 08-25-16 at 12:18 AM. I just saw Auctioneer updated. Will there be a Legion update for Gatherer? I am getting an error / bug here at "Western Plaguelands". All Iron Ore spawns imported via the Gathere DB, are marked with Gold Ore icons in the hud and map until I mine them manually. Don't now if this is limited to the Plaguelands, to iron ore, or happens with other ores and areas as well. So the error is not limited to the area or the ore.
Had the same situation with Thorium and Rich Thorium in Winterspring. Last edited by Soziopat : 12-20-14 at 04:14 AM. Still getting this error with the latest version for 5.2.
for the update to 5.2 !! Addon requesting update, but I have the latest version? 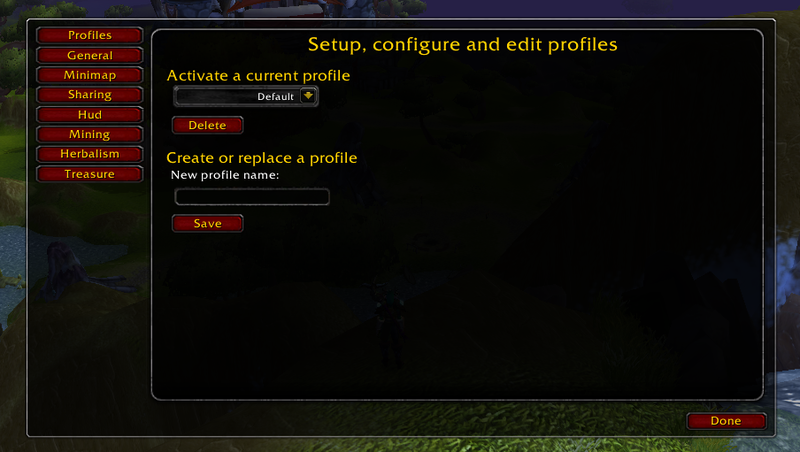 I am getting a window on my toons (as I log them each in, after teh 5.2 patch went live) saying that Gatherer can't identify some zones, and could I please update as soon as convenient. As far as I can tell, I have the latest version. Posted a slightly more detailed version of this comment on the Norganna Forums website. Has this addon become obsolete and support nonexistent? Last edited by gumby_dammit223 : 02-08-13 at 06:51 PM. This error happens every time I loot a gathering node for the first time after logging to one of my toons. Once it happened it no longer happens on that char, but as soon as I relog it pops up again - whether it's the same toon or another one.